On 29 November 2011, educators, curators and actors alike gathered in Zion Schoolhouse to watch three historical skits and to discuss theatrical performance as a history-education tool. What follows is a brief description of the Toronto-based theatre companies that participated in the event and their outreach programs. I conclude with my observations and recommendations as an educator-turned graduate-student. Zion Schoolhouse recently performed “The Secret Life of a Schoolmistress,” an in-situ theatrical performance that depicted the life of fictional educator Hattie Dickson and her challenges to educate in the wilds of Canada. Curricular programs maximize upon this concept, inviting students to spend a full-day in Miss Dickson’s classroom. Attendees are provided with a seat and a name tag. Historical interpreter Maggie Newell teaches students how to “play” children in 1910. Once the rules of engagement are made clear, children learn math, language, and social sciences, much like they would have in 1910. As Zion’s website states, “students connect with the lives of real young people from another time and develop a deeper understanding of the past.” By learning like settlers, children walk away with a better understanding of Canada’s pioneer experience. Zion provides a quasi-real historical situation. The perks – as identified by Zion’s staff – include providing students with the opportunity for personal growth. Role-playing students are more likely to tackle challenging activities (e.g. math equations), knowing that mistakes can be attributed to their character. Should the student answer correctly, they’ve affirmed their own abilities through the protective shield of a twentieth-century character. Unfortunately, Zion Schoolhouse is slated for closure (along with its innovative programming). To learn more please contactFriendsofTorontoMuseums@gmail.com. Single Thread performs both classic and original plays in found spaces. As an educator, what was most interesting to me was their willingness to develop scripts about and/or around a space. I was thrilled to see the piece they developed specifically for Zion Schoolhouse, having been invited to participate in Approaching the Past’s workshop by Rose Fine Meyer; Alex Dault, Brandon Crone, Carys Lewis and Karen Knox stayed true to their company mandate, exploring Canadian history through performance. Actors took on their roles as 1906 school children with enthusiasm. Audience members gained a sense of the sorts of activities settler children would have learned in school: rote reading, writing and stitchery. We were electrified by their call for recess, wanting to jump in and perform with them. Instead, we learned about the games twentieth century school children may have played on the school yard (e.g. clapping games). 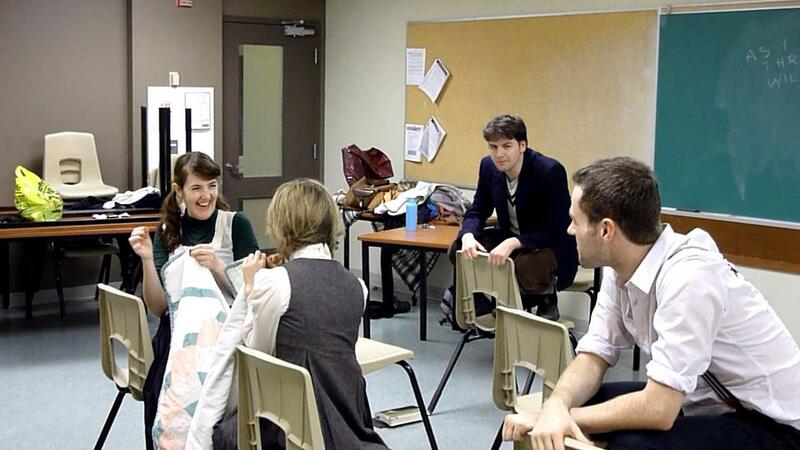 Once the performance was complete, Alex, Brandon, Carys, and Karen shared their creative process, encouraging teachers to assign their students the task of script-research and writing. Single Thread believes that students can use theatre to demonstrate what they have learned artistically. So, what does a script research and writing assignment look like? Single Thread suggests picking a specific time period (e.g. 1906), space (e.g. 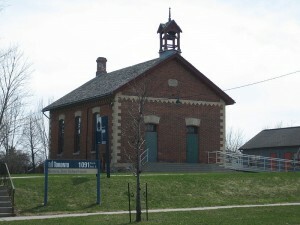 schoolhouse), and theme (e.g. student life) and sending your students to the library, or a Google search engine, to collect resources. The next step involves spinning collected sources into a script. The resulting performance allows you to both evaluate student comprehension and gauge student interests. The perks: you can now fill potential gaps in your teaching, revisiting material that students may have misunderstood. And, you can keep your students engaged by (re)modeling your remaining unit lessons to serve student interests. Much like Single Thread, Native Earth develops commissioned pieces to serve a school’s (or a teacher’s) specific needs. Native Earth is a Toronto-based theatre company that provides support to First Nations artists and writers in the production of First Nations theatre. Their goal? To support the development of First Nations theatrical canon. Native Earth encourages theatre as a form of communication and specifically seeks to communicate experiences unique to First Nations in Canada. Unlike the Zion Schoolhouse and Single Thread, Native Earth emphasized theatre as a tool to stimulate empathy and deepen understanding of minority experiences. Theatre makes students witnesses to different First Nations experiences, experiences that have yet to take a dominant role in our secondary curriculum: ineffective annuity payments, reservation pass system, forced sterilization, the 1960s scoop, etc. Moreover, witnessing stimulates discussion. Native Earth performs theatrical pieces that emphasize the ‘humanness’ of Canada’s underbelly. For Native Earth, outreach not only means visiting schools to share the First Nations experience, but active mentorship for First Nations students. Be sure to direct interested students to www.nativeearth.ca to provide them with access to extra-curricular programs designed to improve writing skills and to offer an outlet for their unique histories. As a participant-observer, I was most struck by the different thematic focuses offered by Anglo-Canadian theatrical pieces (performed by Zion Schoolhouse and Single Thread) and First Nations theatrical pieces (performed by Native Earth) set during the late-Victorian era and early-modern era. Zion Schoolhouse and Single Thread depicted the state as a distant, non-intrusive entity – indeed, one could sit through their performances without thinking of Sir Wilfred Laurier, Indian agents, or the North-Western Mounted Police (NWMP). As such, I began to understand the importance of visiting Zion Schoolhouse and/or inviting Single Thread and Native Earth into your classroom. Many high-school textbooks emphasize Canadian nationhood as an outgrowth of World War I. The state is something that accumulated power after 1914 – this is not to downplay the role of the railroad in “nation-building.” While we don’t have a historical narrative that matches America’s “Wild West,” we promulgate a history of settler independence, of “roughing it in the bush.” Federal agents provided the railroad, but settlers built community. Performances by Native Earth balance this narrative of independence, showing us that settler privilege was built upon the disempowerment of First Nations. We have, at our fingertips, a non-threatening tool through which to teach multiple Canadian experiences and to complicate notions of the state as a hegemonic entity. – Zion Schoolhouse indicates the role-playing boosts students’ confidence in his/her ability to learn the target material by providing a shield for error. – Zion Schoolhouse, Single Thread, and Native Earth indicated that theatre allows students to connect emotionally with the subject matter by allowing them to revisit the past and/or align themselves with a historical personage. – Native Earth emphasized emotional connectivity as essential to improving students’ understanding of the First Nations experience by temporarily breaking-down barriers and stereotypes that prohibit meaningful engagement with First Nations material. – Zion Schoolhouse, Single Thread, and Native Earth suggest that theatre helps students to fully contextualize historical facts and figures by simulating lived experience. Interesting piece. As a tangent to your main topic, I’m surprised you didn’t explicitly mention that Zion Schoolhouse is one of the local Toronto museums being slated for closure by the municipal government under Rob Ford: . This would be a significant loss for elementary school students in the city, who would not only lose the performances you discuss, but the other programming that has gone on there. I have very fond memories of class trips to Zion Schoolhouse from my elementary school days – and can take credit for planting some of the trees on the grounds during an Arbour Day event in the 1980s. Thank you for your thoughtful comment. Zion Schoolhouse is, indeed, an “endangered” museum. City Council will be voting in a few weeks to close four municipally-operated heritage buildings: Zion Schoolhouse, Gibson House, Market Gallery, and Montgomery’s Inn. Approaching the Past’s most recent event demonstrated, as Rose Fine-Meyer predicted, “the excellent work of our city museums.” I believe that the programming available at city museums is worth saving. Individuals seeking more information about museum closures can direct their questions to FriendsofTorontoMuseums@gmail.com.